If you're looking for diamond ring that's a little different from the crowd, consider one with a pear-shaped diamond centerpiece. In this beautiful 14k rose gold design, a 1.02-carat, pear-shaped diamond rests in a narrow diamond-studded band. It retails for just over $5,600. The curves of a pear-shaped diamond lend themselves to the contours of a twisted band. This pretty 14k white gold ring features a 1.13-carat, pear-cut diamond set twisted band with channel set round diamonds. It retails for just over $1,700. A pear-shaped diamond looks gorgeous in a simple solitaire band. In this classic 14k white gold ring, a .5-carat, pear-shaped diamond takes center stage. This ring retails for less than $900. A split-shank ring setting plays with the symmetry of a pear-shaped diamond in this beautiful rose gold ring. Dozens of tiny round diamonds accent the shank of the ring and add even more sparkle to the center gem. This ring has a total weight of 4.11 carats and retails for about $48,000. For a vintage look, choose a ring whose pear shape is formed by pave set diamonds. In this gorgeous 10k white and pink gold design, the center stone is actually a round diamond and it is surrounded by two, overlapping pave-set pear shapes. The band shows off a trendy twisted band, also encrusted with diamond for a total weight of .5 carats. This beautiful ring retails for about $650. Channel-set princess-cut diamonds are a counterpoint to the soft curves of a pear-shaped center stone. In this modern design, a 1.76-carat pear diamond rests atop a rose gold band set with another carat of princess-cut diamonds and pave set round diamonds that flank the center stone. This ring retails for about $10,000. 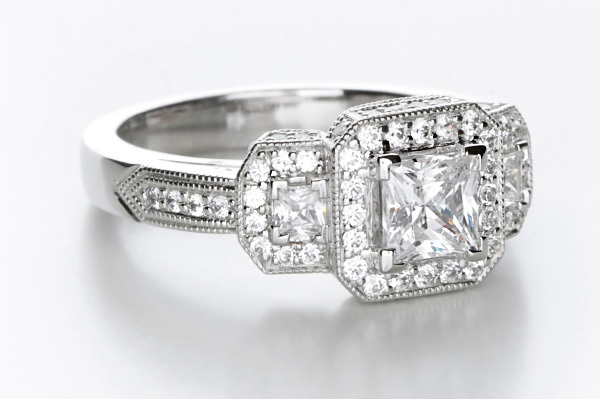 Princess cut diamonds are the perfect accent choice for the tapered shape of a pear center stone. This sweet 14k rose gold ring features a 0.5-carat pear-shaped diamond flanked by two smaller princess cut diamonds. The band also features channel set princess diamonds for extra sparkle. It retails for about $2,400. A pear-shaped diamond looks lovely in an embrace-style setting. This modern design features a split band with round diamonds. In the center rests a larger pear-shaped diamond, giving the platinum ring a 1.01 total carat weight. This design retails for about $1,500. For even more visual impact, choose a ring with a pear-shaped diamond surrounded by smaller stones. In this beautiful 14K white gold example, a .2-carat pear-shaped diamond is ringed in a halo of tiny round diamonds. The band is also encrusted with smaller round diamonds for a total weight of .5 carats. It retails for about $700. Pear diamonds don't have to be colorless. In fact, brown diamonds look stunning. This gorgeous platinum ring features a 1.5-carat fancy brown, pear-shaped diamond in a frame of colorless diamonds. More colorless diamonds accent the dainty shank. This ring retails for about $5,000. Whether you choose a fancy-colored diamond or a simple white diamond in a solitaire setting, you'll enjoy the unique beauty of this pretty diamond shape. A pear-shaped diamond is an instant classic that will look stylish and lovely for years to come.